cold milling or utility adjustments. Streets and highways are the arteries of cities, counties and states. During these times of sequestration and budgetary cutbacks, public works agencies must maximize their limited budgets by choosing the most fiscally-responsible maintenance strategies possible. ARAM is a cost-effective option in both the short-term and the long-term. 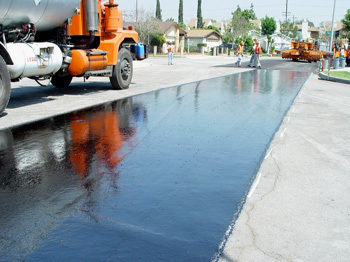 In the short-term, ARAM applications can often avoid costly utility adjustments and cold-milling on residential streets, while providing over ten years of maintenance-free performance for long-term cost savings. On arterial streets, ARAM is often an alternative for reconstruction that provides both a significant cost savings in the short-term and maintenance-free performance of 15 years or more in the long-term. reduces the amount of structural material used. ARAM uses less material than other conventional treatments and as a result, saves money with reduced physical material and hauling costs. 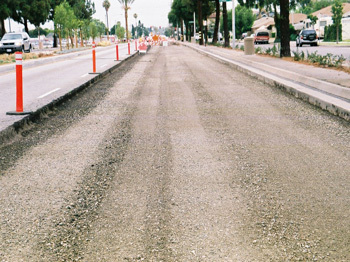 At just 3/8 of an inch thick, ARAM has an established Caltrans design equivalency of 0.17 ft of conventional hot mix asphalt that allows less structural hot mix asphalt to be used as a final overlay on composite layering systems without sacrificing long-term performance. Since it is only 3/8 of an inch thick, System 1 applications rarely require cold milling or utility adjustments. These advantages are not just cost-effective, but significantly minimize public inconvenience by decreasing the project time. In addition, ARAM qualifies for the CalRecycle RAC Chip Seal grant program, which reimburses cities and other agencies up to $250,000 for each project. This money not only helps with the bottom line, but reinforces the underlying environmental benefit of utilizing 600 scrap tires per lane mile recycled through the use of ARAM.